The story of a man who wakes up in bed suffering from memory loss after being in an accident, only to begin to suspect that his wife may not be his real wife. 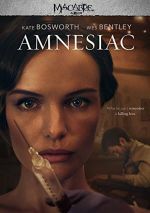 A thriller in the Hitchcock vein, 2015’s Amnesiac introduces us to a man (Wes Bentley) who suffers substantial memory loss after a serious car accident. When he wakes up, a woman (Kate Bosworth) claims to be his wife and takes him home to care for him. This seemingly simple path becomes more complex, though. The man bears no memories of the woman and eventually comes to suspect she isn’t who she claims to be. The man struggles to cope with this situation and the drama that pops up along the way. Though I initially referred to Amnesiac as a film in the Hitchcock wannabe camp, in many ways it more resembles 1990’s Misery. Both feature mentally unstable women who imprison injured men in their homes. The big difference is that Misery offered an interesting tale while Amnesiac delivers nothing more than 84 minutes of tedium. Right off the bat, I find myself irked by the movie’s choice not to give the characters names. This seems like a silly conceit that serves no obvious purpose. Yeah, I get that it tries to play into the man’s lack of memory, but it fails. Instead, it smacks of pretension and becomes an off-putting way to launch the film. Amnesiac abounds with other artsy quirks that ensure it stays tough to embrace. The characters never offer any personality or anything to make them interesting. The movie dollops out background info at a snail’s pace, so by the time we learn the minor slivers it throws our way, we don’t care – the tale taxes our patience to the point where we mentally bail long before it ends. A thriller without any tension or drama is one that fails at its core. I’m fine with a movie that gives us a slow, deliberate pace, but I want to feel like I’m on a journey somewhere. That never occurs with Amnesiac. The film plods at such a slow rate that the viewer fears it’ll never go anywhere – and those worries largely come true. Sure, some drama emerges along the way, but again, it takes so long to get there that the audience becomes unlikely to care. Neither Bosworth nor Bentley can do much with their parts. Both are talented enough actors, but when saddled with such flat roles, they get stuck in a corner. Bosworth suffers the most. The woman becomes little more than a repository for pointless trivia non sequitors and random violence. Bosworth plays the role with chilly diffidence and doesn’t make the character anything vaguely engaging. Even at a mere 84 minutes, Amnesiac feels long. Too slow and too pointless, it becomes a poor thriller. Amnesiac appears in an aspect ratio of approximately 2.40:1 on this Blu-ray Disc. Expect positive visuals here. Outside of some intentionally blurry photography, sharpness appeared good. The movie displayed nice clarity and definition, with nary a soft spot on display. Jagged edges and moiré effects failed to appear, and I also noticed no edge haloes or print flaws. In terms of palette, Amnesiac favored quiet tones. It went with gentle teal and/or amber much of the time. These hues lacked much pep but they seemed fine. Blacks appeared full and dense, while low-light shots gave us good clarity. I felt pleased with the transfer. Though not packed with action, the film’s DTS-HD MA 5.1 soundtrack accentuated the story. Most of the livelier moments related to the car crash that opened the film as well as flashbacks to the event; those managed to use the spectrum in a vivid manner. Otherwise, the film emphasized quiet ambience and not much more. Within those gentle confines, sound quality satisfied. Music was full and rich, while effects demonstrated nice clarity and accuracy. Speech came across as crisp and natural. The mix didn’t do much but it seemed acceptable. The disc opens with ads for The Diabolical, Time Lapse, and Wrecker. We also get the trailer for Amnesiac but no other extras appear here. If you conjure a boring version of Misery, you’ll wind up with something like Amnesiac. Derivative, slow and misguided, the movie lacks any thrills or drama. The Blu-ray provides solid picture and acceptable audio but lacks any notable bonus materials. Leave this snoozer on the shelf.